After three months of waiting, I finally got not just one but two Nikon D850 camera bodies and the Nikon MB-D18 battery grip that goes along with the Nikon D850. My thanks to Roberts Camera and B&H Photo for getting me those two D850s. Having put my order in only one day after the camera was announced, you can tell just how popular this new Nikon has been. There is still huge demand for the Nikon D850. On specs alone, the D850 is a powerhouse. Building upon the exceptional legacy of the Nikon D800 and D810, the D850 pushes the boundaries of high-resolution camera technology. So far, in my testing, it lives up to the hype. The Nikon D850 is the culmination of everything Nikon has learned about building DSLRs. As this is their 100th anniversary, the D850 seems like a perfect product to celebrate that legacy. I realize these opening paragraphs sound more like a “fanboy” review than a critical look at the D850, but don’t worry, we’ll get there. For myself, as an adventure sports photographer, I have always had two different types of digital cameras. One was a camera with a fast frame rate specifically for photographing sports and the other, especially since the D800 came out, was a high-resolution camera for sports that didn’t require super fast frame rates and also for portraits, landscapes and lifestyle images. Along the way, I fell in love with the image quality of the Nikon D800 and D810, especially when I needed to make large prints. My Nikon D4 has been languishing of late as I rarely use it unless I absolutely need the 11 fps frame rate (as when shooting surfing). In the last few years I also bought a Hasselblad H5D 50 MP camera, which has really spoiled me on the image quality front. With the introduction of the D850, Nikon produced a camera yet again that was better than I had expected. In fact, it is a camera that I have been dreaming about for ten years now, one with both incredible resolution and a decently fast frame rate. From the first moment I picked up the camera it felt great in the hand. I have large hands so the deep grip on the D850 fits really well. Ditto for the MB-D18 battery grip. The pull out LCD on the back of the camera is also a welcome change. I am not sure why it took so long to add a movable LCD onto the back of pro cameras but there are plenty of times that it comes in handy. The touchscreen LCD and touchscreen menus is also a huge time saver. The first time I saw the scroll bar to go through images my mind was blown. Any other method to scroll through images seems crazy now. Also, the touch menu layout is massively faster than pushing buttons and dials. I can change setups in less than half the time using the touchscreen menu options. These last two tweaks really made going back to the D810 or the D4 painful. There are all kinds of other little features that have improved the camera as well, but have also taken a little time to get used to. Nikon switched the position of the ISO button and Exposure Mode buttons and I have been constantly pressing the wrong button with the camera to my eye for the last month. I am just now getting used to the new button placements–and they make sense. Having the ISO button right there behind the shutter release is much better than where it was on my D810 or D4. The D850 also has more custom function (Fn) buttons than the D810 and D4, which is nice for accessing custom functions I use often. There are so many ergonomic improvements that until you use the camera for a while you just don’t realize how much better it is than earlier models. With 45.7 megapixels, the Nikon D850 isn’t lacking in image detail. The Nikon D810 had and still has remarkable image quality. Given that, the D850 has a lot to live up to. Luckily, it is just as good if not better than the D810 in almost every regard. The Dynamic Range of the camera is almost identical to the D810, the noise is well controlled over the entire ISO range (up to ISO 12,800), and the overall image quality is technically superb. In tests against my Hasselblad H5D 50c WiFi, the D850 faired extremely well against the much more expensive Hasselblad. In the center, the images were almost identically sharp when comparing an ISO 64 D850 file against an ISO 100 H5D image file. The H5D image was cleaner overall in terms of noise but that is to be expected. As shown in the screenshot below, where the H5D really outshines the D850 is in the corners. The D850 (on the left) was noticeably softer in the corners than the Hasselblad H5D (on the right). For this comparison no sharpening was applied to either image. I realize comparing the D850 to a top-end medium format camera costing nearly five times as much as the D850 seems a bit overkill but many will be wondering just how well it does in this category. Note that in this test I chose an aperture of f/8 for the D850 and an aperture of f/11 for the H5D giving an approximately similar depth of field. The Nikon D850 had the excellent Nikkor AF-S 85mm f/1.4G lens on it and the Hasselblad has the remarkable HC 100mm f/2.2 lens attached to it, which is a very similar field of view as the Nikon 85mm lens. What I have found so far, and I have only been shooting for a month with the D850, is that this camera is pushing Nikon’s best lenses quite a bit harder than the D810 did. All of my lenses are the top end Nikkor zooms and primes, so I have the best lenses Nikon makes, but I can see that if Nikon (or any camera manufacturer wants to push the resolution boundaries higher than 50 MP they are going to have to re-vamp their lens lineup with higher quality glass. This isn’t to say that the Nikkor lenses are bad, just that the cameras are now at the point that the lenses really matter–even moreso than with the Nikon D810. Another factor when it comes to image quality, which was the case with the D810 as well, is how you handle the camera. The D850 isn’t a standard 35mm DSLR. You can’t think of this as a “run-and-gun-it” style camera like the Nikon D5 or any other sub 24 MP camera. The D810 was comparable to a 4×5 film camera in terms of resolution. The D850 is somewhere between a 4×5 camera and an 8×10 camera in terms of resolution. Because of this much higher shutter speeds are required when handholding the camera to get sharp images. When was the last time you saw someone handholding a 4×5 camera? Think of the Nikon D850 as an 8×10 field camera and you’ll get the best image quality out of it. If you are shooting handheld, I highly recommend shooting with a minimum shutter speed at least four or five times the focal length. For example, if I am shooting with my trusty 24-70mm f/2.8 zoom, the bare minimum shutter speed I would handhold that lens at would be 1/250th second and even that would be dicey in terms of getting a tack sharp image. With my Nikon 70-200mm f/2.8, I wouldn’t dream of handholding that lens at anything less than 1/800th second–even with the Vibration Reduction on. If I want to assure tack sharp images with the 70-200 I aim for 1/1,000th second or faster shutter speeds, more likely 1/1,500th sec or higher. To get tack sharp images at lower shutter speeds the D850 would need in-body stabilization like that found in it’s mirrorless counterparts. For landscape photography, Nikon has done an excellent job reducing the shutter bounce and vibration in the D850. But, with that said, you will need to lock this puppy down on a serious tripod if you expect to get tack-sharp images at any shutter speed below 1/125th second. And by serious, I mean a beefy heavy duty tripod. None of those wimpy tripods with extendable top tubes need apply. I use the same Gitzo GT5541LS tripod that I use with my Hasselblad when shooting landscapes with the D850, and I also use a large ballhead to make sure everything is locked down tightly. For the best results, just as with my D810, I also use the mirror up option along with Exposure Delay mode (3s) and the Electronic front-curtain shutter mode to eliminate any vibration. This isn’t to say that I shoot with the D850 on a tripod all the time. It has quickly become my all around camera and I shoot most often with it handheld, especially when shooting adventure sports. I just make sure to use a fast enough shutter speed, as noted above, to make sure I counteract any camera shake that might introduce motion blur into the image. I am definitely not the steadiest photographer out there. I drink way too much caffeine. The upshot here is that when care is taken, the D850 produces absolutely stunning images. From what I have seen so far, the D850 has the best image quality Nikon has ever produced in any of their DSLRs. According to DXOMark, the D850 has the best image quality of any full-frame interchangeable lens camera on the market. When the Nikon D5 came out, I shot with it for several days during a DPReview Field Test. The D5’s autofocus was astounding. One of the biggest draws for me with the D850 was that it has the same AF module as the Nikon D5. Having a camera with best-in-class AF, along with the 9 fps, and 46 MP resolution makes for a pretty alluring piece of technology. That was pretty much all I needed to hear to get excited about the D850. The big question: Does the AF in the D850 live up to the D5’s autofocus? I haven’t done enough testing to know for sure if it is on par with the AF incorporated into the D5, but compared to the D810 and my much older D4, the D850s AF is a giant leap in performance. Over the last month since I got the camera, I was doing a few demos for Elinchrom with their new ELB 1200 battery-powered strobe kit. For the first two demos, both done in a studio setting, I used my Nikon D810 and even with the modeling lights on the camera had some difficulty tracking the athletes we hired to do a variety of martial arts maneuvers. I used the D850 for the last demo and it had no difficulty whatsoever tracking wild movements in the studio as can be seen below. This image was created using the 3D Tracking AF mode. When I shot with the D5, the 3D tracking AF mode seemed like it could read your mind and kept whatever you locked onto tack sharp even with extremely fast moving subjects. The D850 seems to do incredibly well with the 3D Tracking AF mode as well, and this will come in handy for recomposing while tracking fast moving subjects. Autofocus has always been something that tied me down to a few focus points when shooting action. Before the Nikon D5 and its 3D Tracking AF mode, I had never seen an AF mode that allowed you to concentrate on the composition and forget about AF like with the D5. So far, with the D850 I have not shot a lot of crazy sports but I will continue to test it’s autofocus. One thing I can say for sure, if you are frustrated by the D810s autofocus, the D850 will be a massive improvement on that front. There are lots of folks online who have run tests on the D850 comparing it’s AF to the Nikon D5 and found the D850 not quite as good as the D5. I am not shocked by that, and so far that is what I am finding as well. The D850 has more than twice the resolution and a slower frame rate than the D5. The higher resolution sensor is more sensitive to AF errors, which means the D850 has to have way more accurate AF than the D5–because you will see those inaccuracies clear as day when you zoom into 100% on these image files. Regardless, the AF of the D850 is utterly superb. As with the D810, I highly recommend fine tuning the AF for each lens you own and use. With the D850, it is quite a bit easier to fine tune the AF for each lens than it was with the D810 because Nikon has included an AF fine tune option in the D850 as they did with the D5 and D500. PetaPixel posted a great article entitled How to Use Auto AF Fine Tune on Your Nikon DSLR the Right Way. I highly recommend watching this video and dialing in the AF Fine Tune settings for all your lenses. This will make the AF much more accurate. There are other websites, notably DPReview and DXOmark, who have done extensive testing on how the D850 compares to the Nikon D810 and other cameras in terms of dynamic range. I won’t get to crazy here but in my experience so far the D850 matches the D810 in terms of dynamic range. The D810 was a class leader in this respect and that was a big reason for the fanfare over that camera. Having a camera with such an expansive DR allows me to capture incredible detail in both the shadows and the highlights by exposing for the highlights and then pulling the shadows up in post. With the D850, I have been able to pull out at least four stops or more from the shadows just as with D810. As can bee seen in the image above, the D850 has excellent dynamic range. For this image, shot on the Torre atop the Serra da Estrela mountain range in central Portugal, I exposed for the bright sky and then pulled up the shadows in the mountains. At ISO 64 the D850 has nearly 15 stops of dynamic range which is among the best of any cameras out there and comes close to rivaling the best medium format cameras. When I purchase a new camera, one of the standard tests I run on it is a still life shoot at every ISO setting to see just how much noise builds up as I crank up the ISO settings. Since I work in a wide variety of situations knowing just how far I can push the ISO is critical to making sure I come back with the images. With the D810 and now the D850, knowing how much noise is created at various ISOs is even more important because if I am shooting handheld I will likely be working at ISO 400 and above quite often just to get the fast shutter speeds required for tack-sharp images. I know this part of the review will be a bit on the geeky side, but as a pro you have to know your gear. Prior to this, my Nikon D4 has been the High ISO champion. It still has lower noise at high ISOs than even the Nikon D5. The only other camera that does better than the D4 is the Sony A7s II, but it is only a 12 MP camera. Generally as you raise the megapixel count the amount of noise exhibited at all ISOs increases. The 50 MP chip inside the Hasselblad X1D 50c and H5D 50c, as wells the newer Hasselblad H6D 50c (and all other version of that medium format chip) have the lowest noise I have ever seen in any camera – be it a medium format camera or 35mm DSLR. Hence, as a benchmark, I have tested the D850 against not only my tried and true Nikon D4 but also against the Hasselblad H5D 50c. Let’s jump into the results. First off, let’s compare the D850 to the D810, which it replaces. 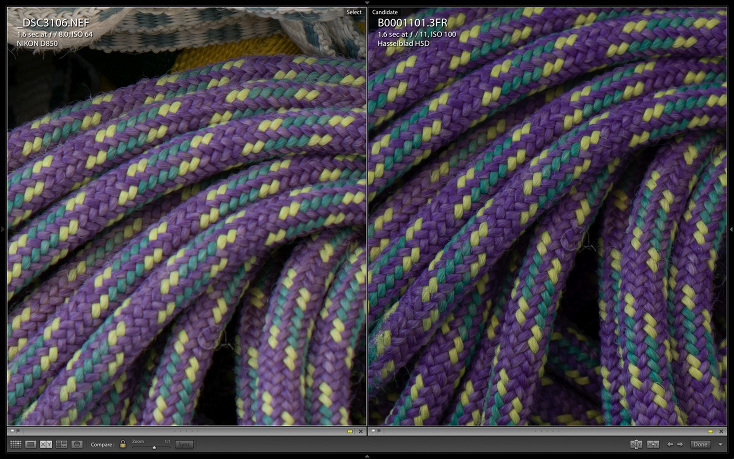 In the screen shot below, the D850 image is on the left and the D810 is on the right. Both images were shot at Iso 6400. The D850 exhibits pretty much the same amount of noise as the older D810. Given that there are 10 more megapixels packed onto a sensor of the same size that is pretty impressive. If you downsize the D850 file to the same size as the D810 and compare them then the D850 is even better than the D810. I am guessing this is all due to the Backside Illuminated sensor built into the D850 that is reducing the noise so essentially there is no noise increase. Now, comparing the D850 to the Nikon D4, we see that the D4 is still a much cleaner file. In the screenshot below the D850 is on the left and the D4 is on the right. Both images were shot at ISO 6400. The D4 image file is ultra clean at ISO 6400. Because the D4 creates a 16 MP file it is much smaller than the 46 MP D850 file. The size difference here also makes it hard to tell how they would appear in a similar size print. To get a better comparison, I downsized the D850 file to the same size as the D4 image file. Again, the D850 is on the left and the D4 image file is on the right. With these image files size exactly the same the D4 still looks a little cleaner than the D850 but the D850 isn’t that far off. In fact, looking closely at these two images side by side it is like splitting hairs as to which one is the cleaner image file. This is a pretty amazing feat by Nikon to have a 46 MP image file that will print just as cleanly as the Nikon D4’s 16 MP image file. In working with the D850 images I also have found that they have a very organic type of noise, which is easy to clean up in post-processing. If exposed correctly and processed with care, ISO 6400 image files from the D850 are eminently usable. Now, for the final comparison, in the screenshot below we have the D850 on the left and the Hasselblad H5D 50c WiFi on the right. Both were shot at ISO 6400 with approximately the same focal length lens. As you can clearly see, the H5D image file is ridiculously clean at ISO 6400. The D850 file is much noisier. The color fidelity of the H5D image file is also a lot nicer but that is mainly due to the 16-bit image processing pipeline in the H5D. Still, the D850 did quite well in this stress test. The Nikon D850 did incredibly well in these tests and showed itself to be a real contender at High ISOs, which is not something you would normally think for such a high resolution camera. This was the main test that was going to tell me if I should sell off my D4 or not. If the D850 can match the low noise of the Nikon D4 at High ISOs, and has way better AF, then why would I hold onto that D4? When I can shoot with 46 MP instead of 16 MP and have a lot more options for cropping in post I can’t see why I would ever shoot with my D4 again. Kudos to Nikon, they have not only created a high resolution camera with stellar image quality but also one that handles noise very well, which makes this, in my mind at least, a true all around camera. 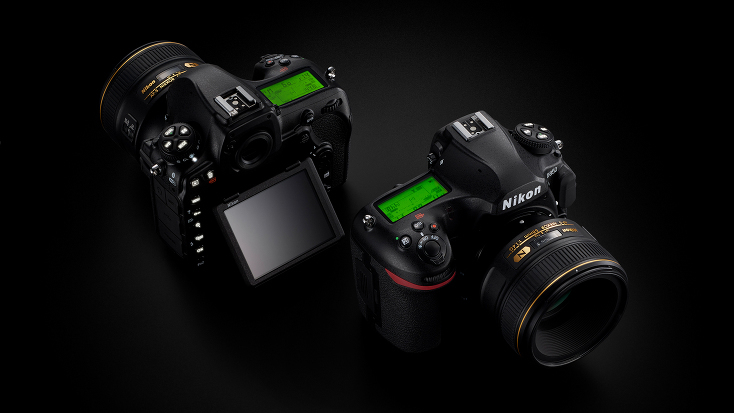 The D850 is the first Nikon camera to have full frame 4K video. What this means is that the low noise output comes through in the 4K video just as it does in the stills. I haven’t used the video feature a ton just yet but from my testing so far the D850 has the best video output I have ever seen in any Nikon Camera. It also has focus peaking, which is a huge bonus, but the focus peaking only works in 1080p. Why it won’t work in 4K I have no idea. If Nikon can upgrade that in the firmware I think they would have a lot of very happy customers. Because of this, I still use a SmallHD monitor when shooting video with my Nikon DSLRs. The image quality of the video is very good and the Flat picture profile allows for capturing a wide range of tones. The Flat picture profile also makes it easy to work up the video files in post. The H.264 video format is a solid codec. The 4K format is UHD, meaning it is capturing 3840 x 2160 pixels. I would prefer that Nikon chose the DCI 4K resolution, which is 4096 ox 2160 pixels as it scales down to 2K output better. In 4K mode, you can only record at 24p, 25p and 30p but in Full HD 1080 mode you can record in slow-mo up to 120p. The D850 video data rate is also 150 Mbit/sec, which is higher than on Sony’s A7 cameras. It still has a video out plug on the side of the camera as well as a mic jack and a headphone jack. The EOS HD website did a great review of the video features on the D850 in a blog post entitled The D850 vs. Everything. In that article they said, “The image quality in full frame 4K mode is truly incredible, the best I’ve yet seen from any DSLR since the Canon 1D C…the D850 is WAY ahead of the Canon camp.” That is pretty high praise coming from a website that is highly critical of Nikon’s video output in all of their other cameras. Nikon has truly done a great job with the video options on the D850. For a look at some video footage check out Little Shao’s promotional video shot with the Nikon D850 in UHD 4k mode. The D850 is a time-lapse machine. It can produce 8K time lapse footage and it can shoot time lapses in the Silent Shutter Live View mode so that creating numerous time lapses doesn’t wear out the shutter. In the Silent Shutter Live View mode it is essentially turning the sensor on and off to capture the image, which can produce some rolling shutter issues so care will have to be taken if you choose this option. I haven’t even had time to try this feature out yet so I will have to do future testing here on how well this works. Having talked with Lucas Gilman, who has done a lot of time-lapse photography with the D850, it seems to work incredibly well. One of the huge selling points for me with the D850 was the option to add the Nikon MB-D18 Battery Grip and get a frame rate of 9 frames per second. It is this 9 fps frame rate, and its stellar AF performance, that makes the D850 usable for sports photography. The 7 fps frame rate without the grip is ok, but since I have gotten used to much faster frame rates with the Nikon D4 and D5, a minimum of 8 fps would be the lowest I would go to shoot sports. Hence, at 9 frames per second the D850 is just over that. Next to my D4 or a D5 blasting away at 11 or 12 fps the D850 seems a little sluggish, but I have found that all those extra frames just add up to more headaches in post trying to edit images down to the top selects. If I was a sports photographer shooting more normal sports like football, basketball or the Olympics those faster frame rates might be required. For most of my adventure sports assignments if I can’t capture the image at 9 fps then I have more important issues to consider than which camera I am using. And if I really need those extra high speed frame rates above 9 fps I can borrow a D5 from Nikon or rent it. Those extra two frames per second come at a steep price. The price of the MB-D18 Battery Grip is $399.95 USD just for the grip. To actually allow the D850 to get up to 9 fps you will also need the Nikon EN-EL18b battery (the one used for the Nikon D5 or D4, which goes for $149 USD) and the BL-5 Battery Chamber Cover (another $24.95 USD) to hold that larger battery in the grip. You will also need the Nikon NH-26aAK battery Charger to charge those larger size batteries and that charger is rather pricey at $369.95 USD. Adding that all up, to get to 9 fps you will have to spend an additional $943.85 USD. That is unless you already own a Nikon D4 or D5, in which case you will already have the batteries and the battery charger. Needless to say, that is a lot of money to gain a few extra frames per second. Aside from the expense, the MB-D18 battery grip is very nice and certainly enhances the ergonomics when shooting vertically. The grip also seems more stable than the D810 grip and has a much much better button layout on the back of the grip which mirrors the same button layout when shooting horizontally. The grip is also extremely comfortable in the hand and allows my pinky to rest in a very natural spot when shooting horizontal as well as vertical. All in all, the grip is a great addition for those that need it. As an adventure photographer, I love having a camera that I can break down into a lighter weight rig when I need it or add a grip to get extra battery life and performance when weight isn’t an issue. In that respect the D850 feels like a massively upgraded Nikon D700. The buffer depth of the D850 is quite good considering the size of the 46 MP image files. In Continuous High mode, without the MB-D18 Battery grip, and shooting only to a wicked fast XQD card, you can get up to 51 or so frames at 7 fps before the buffer kicks in and slows down the frame rate. Sadly, one of the very few knocks I have against the D850 is that when you bolt on the MB-D18 and use the EN-EL18b battery to gain the 9 fps frame rate, the buffer slows down the frame rate after only 20 to 23 frames. So, essentially you get about 2 seconds of shooting at 9 fps before the buffer slows you down. It makes total sense, after all we are shooting 46 MP images at 9 fps so that is pretty incredible. I have just gotten used to the seemingly endless buffer in the D4 and D5 cameras but they were shooting much lower resolution image files. Even with this limitation, the D850 is still a marvel. To get 9 fps with 46 MP images is worth it even if the buffer isn’t endless. Of course, if you have your camera set up to shoot to both the XQD card and the SD card for backup, the buffer is even shorter than those specs listed above. If you want the fastest write speeds you will need to buy the fastest XQD cards on the market from Sony. We will get to that in the next section. To get the best performance out of the D850, choosing the right memory card, and specifically the best XQD card is a huge factor. The XQD memory card format has gotten a bad rep for some reason. I am not sure why. In my experience using pretty much every memory card format on the market the XQD cards are the best out there and they are my personal favorites. They are smaller than CompactFlash cards, large than SD cards and are tougher than both. They are also not as fragile as the CFast cards and they are faster than any CFast card on the market. I really hope they are adopted by more camera manufacturers because they are the memory card format of the future. I think most photographers groaned about the XQD cards because it meant they had to buy new memory cards. These days, since Lexar bit the dust, the Sony XQD cards (as shown above) are the only option. Their latest G-Series XQD cards are wicked fast and they are my top recommendation for the D850. They come in 64 GB, 128 GB and 256 GB sizes. All of them are crazy fast and they also download faster than any memory card I have ever used. If you want the best performance with the D850 then these are the cards you want. I purchased three of the 128 GB cards when I bought my D850. If you don’t already have an XQD memory card reader I recommend the Sony XQD/SD Card Reader. Nikon’s SnapBrige App can wirelessly tether with the Nikon D850, but in my experience it is clunky, especially with the giant 46 MP image files coming out of the D850. Unlike my earlier experiences with SnapBridge with the D500 where I couldn’t even get it to pair with the camera, SnapBridge did pair with my D850. Pairing the D850 with SnapBridge is not as easy as you might hope. To actually download images to an iPhone or iPad, you have to engage the WiFi on the camera after connecting it to SnapBridge via Bluetooth. Even with wicked fast WiFi here in my office it took forever to download even one image much less all those on the memory card. Hence, the usefulness of the app seems dubious for a camera like the D850. What I did find to be very useful was the remote control part of the SnapBridge app, which allows for remote control of the D850 with live view on my iPad. You can change the shutter speed, aperture, ISO and also focus the camera which is pretty awesome–all the while with a live view on your iPad or tablet. I can see using this in a bunch of different situations. It would be great to see Nikon really improve this app as it has promise, but it just isn’t there yet. The D850 is indeed Nikons best camera ever. Having shot with it over the last month it is very hard to go back to my D810 or my D4. The D850 does everything extremely well and it is the most capable Nikon camera I have ever shot with. Shortly after getting my first D850, my outstanding order with B&H shipped so that I now have two of them. I have had some time to figure out if I would keep the second body or not. As I write this conclusion, I have decided to keep both D850 camera bodies and to sell both my D810 and D4. The D850 is simply that good. It is a better camera than either the D810 or D4. With the D850, it isn’t just the image quality, or the 9 fps frame rate, or even the massively improved video options, it is having all of this and so much more in one camera body. As DPReview said in their analysis of the D850, “this just might be the most well-rounded stills camera ever…we’re comfortable saying the D850 is the best DSLR on the market today.” I heartily agree. There are so many new features on the D850 that in the month I have had the camera I haven’t even been able to test them all. I will certainly be testing the camera for some time to come. There are, if I am honest, more features in this camera than I really need. But, who is going to complain about that. I will also say that Nikon has quite the line up of cameras right now. Not everyone will need a 46 MP camera. For most amateurs Nikon’s D750 is probably still the best all around camera. For those pros or discerning amateurs the D850 is the pinnacle of camera design. It is so alluring that some who have crossed over into mirrorless have been coming back to DSLR world just for the D850. With the D850 and the Hasselblad H5D 50c WiFi, all of my cameras (save for the GoPros) are at 46MP or 50 MP. I have become an addict to high resolution cameras because the resulting images print incredibly well. With the 36 MP D810, I could print those images up to five feet (1.5 meters) long and they looked spectacular. With the D850 I can go even larger. Aside from the print resolution, the D850 also allows clients to take vertical crops out of horizontal images, which is a great feature when it comes to publishing ads in magazines or for magazine covers. One last note here, looking towards the future, I have a feeling the D850 will be my last optical viewfinder camera–in other words my last DSLR. I have no doubt that Nikon is working on a pro-caliber mirrorless option. They better come out with something amazing or they will lose market share in a huge way. I am hoping they release an incredible mirrorless option in 2018. I am sure Canon is also working on this as well. With Sony chomping at the bit and releasing a whole slew of impressive cameras this past year, they are quickly changing the game and have been for years now. I must admit, I much prefer optical viewfinders over EVFs, but the technology has gotten to the point where EVFs are acceptable and the mirrorless cameras have options that cannot be implemented into DSLRs. Unless you opt for a smaller sensor, the whole idea of weight savings with mirrorless cameras is a myth. Sony has proved this with their f/2.8 zooms, which are the same size as the Nikon and Canon options, if not bigger. Regardless, mirrorless cameras are the future. My hope is that Nikon can replicate the D850 in mirrorless form with dual XQD card slots, a body that is ergonomically excellent, and with a stellar EVF viewfinder. 2018 is going to be a very interesting year in the photo industry. Kudos to you Nikon on the D850. You hit another home run with it. I can’t wait to see what you come out with next. But, and this is a big one, whatever comes out next has an incredibly high bar to overcome. The D850 is just that good. After shooting over 9,000 images with the D850 in Hawaii recently during a huge swell at Peahi, a.k.a. JAWS, I thought I would add an update here. Shooting with the D850, with the MB-D18 battery grip at 9 fps for four days, I continue to be impressed with the D850. Specifically, while shooting surfers launching down huge 60- to 70-foot waves I found the D850’s autofocus to be outstanding. As can be seen in the image below of Kai Lenny dropping in on a monster wave, he is tack sharp during his bottom turn and also in the following image where all you can see is the top of his head and shoulders. The D850’s 3D Tracking continuous AF mode followed him throughout the series and kept every single frame tack sharp over a series of sixty images. For my work, this is a huge reason why the D850 is ridiculously good. Above you can see a tighter crop on Kai Lenny from the middle image above. Note that he is tack sharp. Also, note that this isn’t even a 100% crop of the image. With 46 MP there is an insane amount of resolution to make pretty severe crops from any full-frame image. In addition to the example above, I shot hundreds of empty waves as well and here again the D850’s autofocus locked on and never let go as in the image below. The only times where the autofocus was off where when a huge wave of spray nailed the front port on my water housing. Needless to say, I am damned impressed with this camera and continue to be blown away by it! With 46 MP I can’t wait to make some huge prints of these images from Peahi. Tony Bonanno - Wholeheartedly agree with everything you’ve said in the review Michael. I received mine the day after they were released and also have the Grip and D5 batteries and adaptors. I’ve used it on corporate events, birds in flight, low light portrait, etc. I’m almost thinking bout selling my D5 and getting a second D850 too. I got the itch the minute you showed me that touchscreen and that crazy fast image browse. And from those high ISO samples you posted, I’m getting one. Andrew Kornylak - Excellent in-depth review as always Michael. D850 is king. …But man that clean Hasselblad shot kind of blew me away! Michael Clark - Yeah, the Hasselblad files, especially the 50 MP X1D and H5D and H6D are crazy clean at ISO 6400. Somehow Hassey has it dialed at high ISOs. The Phase One IQ350 wasn’t anywhere near as clean as the Hasselblad versions for some reason. Landscape Photography - Excellent article, the best I’ve seen on the d850. Interesting to learn about the high ISO capabilities of the Hasselbad too. I might need to add one to my kit. Dino - I just wish Nikon would have added the option to shoot natively 7 fps FX and 9 or 10 without the battery grip in DX as the D500 already does. While I like the D850 for a lot of things in theory, somehow I tried a D4/D4s and I felt much more love at first sight despite the “lesser” MP specs. I’m honestly torn cause that continuous 10/12 fps is truly a joy for the ears and terribly reassuring in certain cases. 7 fps – where you can still hear a pause between a click and the next one – less so. If I have to choose a camera for the next 10 yrs I really wonder if a D850 or a D5/D5s (or even D4s FWIW) is the best choice. What I need most – often shooting also MF lenses – is the camera ability to lock focus with dim light ( I had a lot of problems with the D600 ) and while I know from D750 onwards (more so with D500) focus has gone through a quantum leap, I wonder if a D4s for STILL shooting with mf lenses (and a 300 F/4 or 70-200 F/2.8 for sport and events with decent light) is SO behind compared to D5/D500/D850. I’d really love to hear from you what you think. Basically I shoot a bit of everything, especially portraiture (in whatever light, not only in studio), events (PJ) and sport, this is why I’d rather prefer a faster burst rather and slightly more usability than always being fixed to a tripod because of the too many MP. Thanks in advance. I rarely shoot on a tripod. I usually just crank up the ISO. If you really need the 12 fps of the D5 then that is a special scenario. IF you don’t need the 46 MP then the D4 or D5 makes more sense. It just comes down to your needs. With the D850 I get the ultimate image quality and have the ability to crop. With the MB-D18 battery grip it offers 9 fps, which sounds pretty stinking fast. That is enough for me. It is telling I think, that in a conversation a few months ago with Andrew Hancock, who is a Sports illustrated photographer and a Nikon Ambassador, that he sold off all of his older Nikons and upgraded everything – even his D5 – to the D850. This is why I spent so much time in the review talking about High ISO noise as that was the key for me. It basically matched the noise of the D4, which is lower at High ISOs than the D5 when the images are scaled down to the D4 resolution. The low light AF on the D850 is also WAY better than either my D4 or D810. That might help you out. In the end it is up to you. Rent one and see what you think. The reality is all of this gear is phenomenal. It isn’t the camera that holds any of us back these days. Vern Rogers - I have been reading about the demise of the SLR for many years, yet it remains with us. I fell for the SLR way back in 1959 and it has been my favorite ever since. Even though, over the years, I made good use of other types of cameras, including the wonderful Leica rangefinder models and medium format cameras, the SLR remained my goto camera. Now, at 81, I am anxiously waiting for the shipment of my D850. With big hands and still getting around fine, I find small and light are not solutions for me, but rather a hindrance to a firm and steady hold. No, small and mirrorless is no panecea, but rather a fine addition to what’s available. There will be other trends coming along that will be the next craze. And they will work themselves into what’s available. It is plain that marketing drives the industry and sales people are good at convincing us that they have just what we need. I don’t follow the trends. I get what works, for me! There is room for cameras of all types, including the fine DSLR! John Wilson - Congratulations on your 2 D850’s, you are one lucky man! You are also the first photographer who makes sense to me in that you have a main and a backup that are the same bodies I assume you set up both exactly the same way except maybe lenses then just pick up and go. I could never understand why more people don’t use 2 of the same bodies! Thank you for review! Jeroen - Thank you for this abdolutely awesome real life in-depth review of the Nikon D850. I hope you are able to share your AF settings with me, with us? Obviously AF-C, but then… Release, Focus, Release + Focus or Focus + Release and the settings a3 Focus Tracking with Lock-On and a4 3D Tracking with Face Detection? Michael Clark - Jeroen – I have all of my AF settings at the default settings. I do use back button AF so that is the only custom setting I have set up. Focus Tracking with Lock on is engaged as usual by default. All I did in this case was switch to AF-C and choose 3D Focus Tracking. John Wilson - Well got my bucket list D850 with Tamron 24/70 g2 from Roberts now for one camera one lens one year. Did three day class in Adirondacks kurt Gardner, did Raquette lake 7th Lake and Moss Lake then critique sun pm on big screen, blew him away, he810 and other Canon Students the 5d series and one Sony shooter all said GameOver! Going back for more classes then in July aug do Milkyway and Astro.This unit is unbelieveable! I only used fixed lens Leica X series before, what a trip this and now start savings Sheckles go back to Roberts for another, just confused if I should go with prime or bigger zoom and have to get Tripod and not sure Gimbal or Ball head. Just do landscapes nature architecture , no need battergrip this point don’t do Sports, any feedback on which prime or which tripod and head would be graciously and sincerely appreciated. Thank you! Michael Clark - John – Congrats on your new gear. The D850 is indeed amazing. As for tripods, I prefer ballheads, they are easier to work with. I suggest getting a study tripod and head. Don’t get lightweight flimsy stuff – it will show in your images. The weight of the tripod and head matters. As for ballheads, the Kirk BH-1 and the Really Right Stuff BH-55 are my top picks, also go with the RRS plates for the camera. As for tripods, I personally am a big fan of Gitzo carbon fiber tripods but there are lots of good tripods out there. RRS also makes some great tripods. The best tripods will set you back nearly $800 and the ballheads I mentioned are not cheap either but they will last forever if taken care of. I have had my Kirk Photo BH-1 for more than a dozen years. 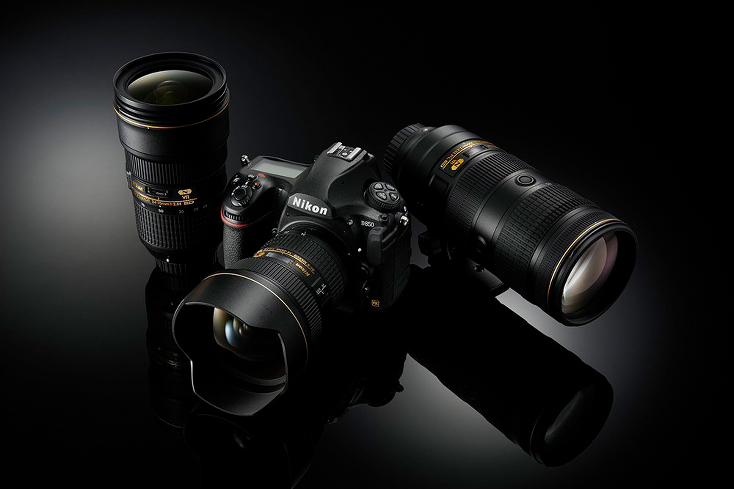 As for lenses, go with the top-end Nikkors or the Sigma Art lenses. Anything less will show on the D850. Zooms or primes, it doesn’t really matter, just stay away from the 24-120, 24-200 type lenses as they are a massive compromise in terms of the image quality. Gus - Excelent Review Michael! Thanks for sharing your experience using your Nikon d850. As you said you have used the Nikon 85mm 1.4G with the Nikon d850, can you give us a little more input of how accurate and responsive is the Nikon d850 focusing at large apertures let say in between f1.4-2.8 range using the Nikon 85mm 1.4 G? I am asking you that since I am considering upgrading from Nikon d800 and this camera and the 85mm 1.4g weren’t exactly what i would called close friends. I know for sure how challenging is focusing at f1.4…but the Nikon d800 wasn’t always that accurate and reliable at 1.4 with fast primes. Other nikons are. Not the case with d800 in my experience. I love the Nikon 1.4G and I use it all the times, not only for portraiture…It will be so precious to me to have input on this matter by a talented photographer that have really push the camera through its paces before upgrading. Thanks in advance for your comments. Michael Clark - Gus – I have found the D850 to be very accurate with my Nikon 85mm f/1.4 and the 24mm f/1.4 for that matter. My older D800 was never as good as the D850 is. Realize that the results may vary depending on the D850 and 85mm f/1.4 samples used. i might have just gotten lucky but so far I have not really seen any reason to calibrate the AF Fine Tuning for wither of my two D850 bodies. They seem way better than my D800 or my D810. Hope this helps. Mike Hammon - Michael, and excellent and comprehensive review, thanks. I received my D850 about a month ago and read Them Hogan’s ebook to get used to the new features and differences with the D810. I’m primarily a landscape and macro photographer and am loving the focus shift capability for focus stacking flowers and landscapes in Zerene Stacker. Much easer to do than manually with the D810. I haven’t used the focus fine tune yet, so thanks for the PetaPixel link. One thing you and Thom have in common is a dislike for the Nikon 24-120/f4 on the D850, which was my walk around lens on my D810. You caution against using it, so what would you recommend? I was going to sell my 24-70/f2.8 and get the new version with VR, but am unsure if its acuity is up to the D850’s resolution. Other ideas? Michael Clark - Mike – Thanks! The 24-120 or any 24-105 type lens for that matter, is pretty soft in the corners. Especially on a 36 or 46 MP camera. Either the 24-70 VR or the older 24-70 would be my top choices. They are not as all around but they are way sharper than any 24-105 type lens. If you already have the 24-70 without the VR I would just stick with that. The newer VR model isn’t quite as sharp as the previous version. david distefano - i just came across this article and i also own a nikon d850 as well as a hasselblad h3dll-22 camera. for your surf images the d850 imho reigns supreme, as well as for most action shots or wildlife photography. when i look at your image of the ropes, the compared images my be technically equal but i see more of a 3D look with the hasselblad. i did a similar test with my hasselblad and 80mm lens against my d850 with my zeiss otus 85mm lens. both were shot wide open. the test subject was my grand daughters doll. the nikon with otus lens blew away, sharpness wise, the hasselblad but the roll off of values particularly on the dolls face gave a much better 3D look with the hasselblad image. everyone i showed the compared images to, picked the hasselblad over the d850 even though the d850 was so much sharper. sometimes i think today that sharpness has become the bar for a good image. i believe we should also be looking at transition of tones and maybe 16 bit vs 14 bit does has value in the transition of tones. I am fairly new to the sports scene only being in it 2yrs but shooting outside of that for 7yrs. My quandary is i own a D850 already and i find i am hitting targets but they are just out of focus in 2-3 of the 10. This is ok as i was post editing for myself. Now though i am asked to shoot on the job in jpeg and its going straight to customers to choose images, so keeper rate is more important. I tried the D5 and found its AF totally different, the hit rate was almost 100% of the time. Thus my quandary, D5 or D850…the price is almost the same now with D850 and grip=D5 price. I shoot low light most of the time indoor arenas, no slower than 1/1250 – 2000 no higher, single point, as 3D just misses the changing targets on D850 thus i need to control the focus point. Would you recommend the D5 over the D850 given they are now same cost? or just order a second D850? i am just to 50/50 about this to decide, thus i wanted to come here as you used the D5 for some time and chose the D850 to use etc. Michael Clark - Kane – It sounds like a D5 might be a better fit for what you are shooting. It has the best autofocus on any camera ever from what I have seen.